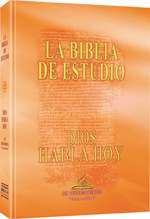 A DHH Study Bible with Deuterocanonical Books in the Old Testament arranged in the Alexandrian order. Features include: Introductions to each book Notes, references, tables, thematic index, glossary, maps and general interest aids. This is an excellent Bible for religious educators and students. Hardcover. 1400 pages 5 ½ x 8 ½ in.